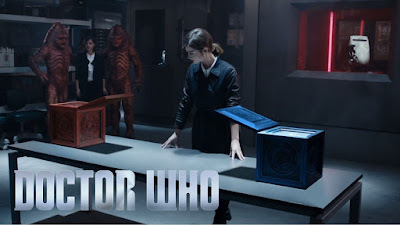 As 'Doctor Who' continues with Series 9 (or Season 35 depending on your geek levels), Peter Harness also continues with the second part of the rather excellent 'The Zygon Invasion'. This time with an episode similarly titled 'The Zygon Inversion', which was also co-written by Steven Moffat. Series 9 is standing quite tall right now as possibly the best season of the new series and the only thing that can break it is one clunker (a la 'In The Forest of the Night' last season)... and I am so happy to tell you that it has yet to hit such a clunker. 'The Zygon Inversion' is in fact, amazing. Wow, where do I even begin with an episode like this? Well first of all, 'The Zygon Invasion' ended on a real cracker of a cliffhanger and thankfully it also gets a conclusion that is more than satisfactory. Whether or not the quality reaching even higher levels than last week is due to the involvement of Steven Moffat, I am not sure, but knowing his skill as a writer of dialogue and speeches - chances are it is judging by what could possibly be the best scene in Peter Capaldi's entire era thus far. But more on that later. Honestly, while I loved the first part of this story, this takes that episode and leaves it in the dust and then shits on the dust. The first part is sadly brought down by the scene outside the church while there is nothing in this episode like that - meaning we have some of the best 45 minutes of Television I have seen this whole year and yet another standout in an already packed season of 'Doctor Who'. The stakes are high in an episode focusing more on the characters and the emotional side of the whole invasion which honestly is exactly what it should have done. It could of been so easy to have this be a huge thing with tons of Zygons roaming the streets of London like any other invasion story - but Peter Harness and Steven Moffat holds back and gives us something with purpose and a very relevant message. This is the kind of maturity I love to see in 'Doctor Who' and Series 9 has done an excellent job of that so far. Just like with 'The Zygon Invasion', this episode looks gorgeous. Of course there are not as many locations but Daniel Nettheim manages to make every single scene feel unique in some way. Yes, the location were the Zygon-human being turned back into a Zygon is obviously where they shot parts of both 'Flatline' and 'The Sound of Drums' (that is BBC budgeting for you) but the lighting and general cinematography makes it feel as different as it can. Speaking of that scene, while 'The Zygon Invasion' made the mistake of not showing any good Zygons, here we finally get a scene like that and it makes the whole conflict so much more justified. Really the only thing that does not look good in the whole episode is the Zygon normalization effect as it literally looks like something I could make in a couple of minutes. This complaint also of course goes for 'The Zygon Invasion' too. Osgood is also thankfully given some much needed characterization here as we finally get to know her first name (and apparently the Doctor's too). She works really well with the Doctor and Ingrid Oliver is more than welcomed to return in my opinion. This is coming from someone who never really cared for the character and saw her as just sort of being there. Jenna Coleman is also really great here as she gets so much stuff to do which just looks like it must have been a lot of fun. The scene were she has only herself on a television to play off of is really tense and showcases that she is a wonderful actress. Now, to the speech... my god this speech. 'Doctor Who' has not exactly been too shabby with speeches before but this took it to a whole new level. This is both an Oscar worthy performance from Peter Capaldi and an Oscar worthy script from Peter Harness and Steven Moffat. It is not often I can call a scene perfect, but every second from the moment the Doctor and company walked into the Black Archive to the final frame of that location is utter perfection. Peter Capaldi delivers his best performance as the Doctor so far and also maybe even the best performance out of ANY Doctor to date. While watching it I doubt even blinked once, my eyes were completely transfixed to the screen as I could not even believe what I was watching... and it just kept getting more and more brilliant. I am not at all over exaggerating when I saw that our current Doctor is probably the best actor to have ever had the role. He is also of course blessed with an absolutely amazingly written speech by Peter Harness and Steven Moffat. A speech with so much pathos and relevance in and out of context and shows that despite 'Doctor Who' being a silly sci-fi family show - is continuously able to produce some of the smartest and most well meaning stories in Television history. Overall, thanks to a perfect 10 minute scene in the Black Archive, 'The Zygon Inversion' is elevated from just being awesome television - into something truly special that will go down as one of the highlights in an already stunning era of 'Doctor Who'. If there was ever a time that the show should get nominated (and even win) for an Emmy and a Golden Globe for a performance - this is it.